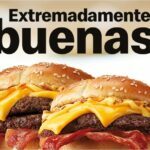 Juicy beef 100% Spanish beef, bacon, Cheddar cheese and irresistible Cheddar sauce. If you are a cheddar lover, enjoy your cheese madness with this hamburger. Price: €5,15 (€8,75 regular meal) (approx. £4.40/£7.50). 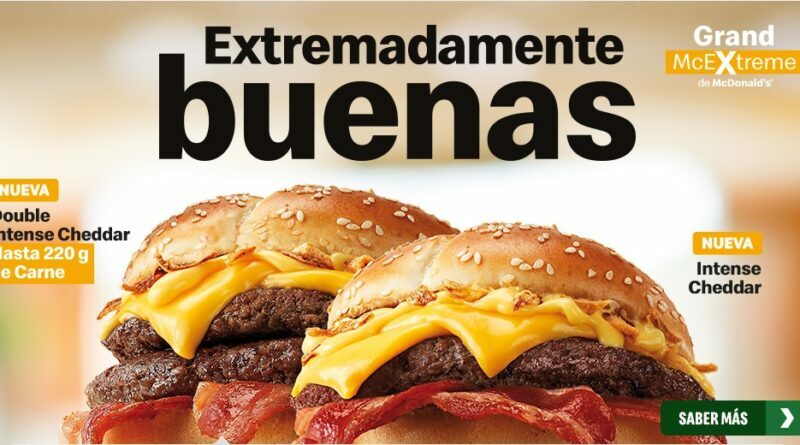 Wow, the name of this burger and the official photos, makes it look and sound amazing. 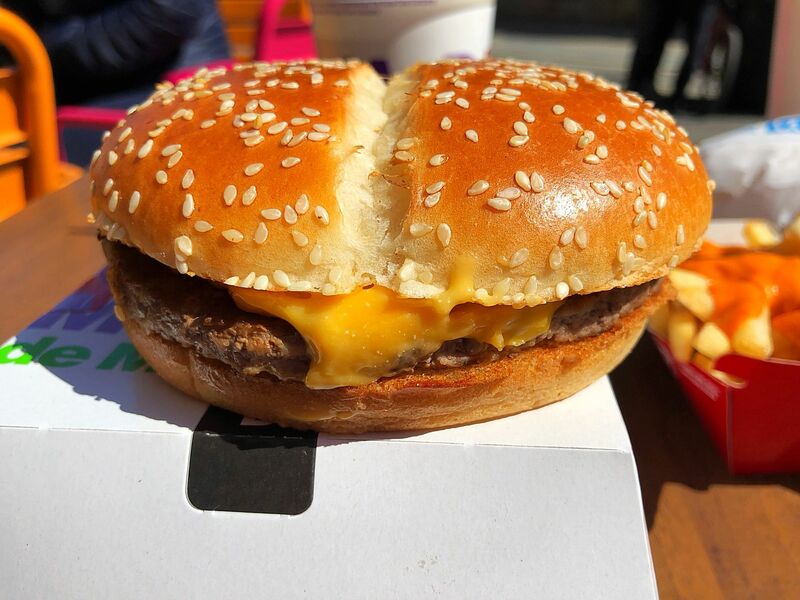 I was looking forward to the Grand McExtreme Intense Cheddar so much (even bypassing the equally good-looking Fondue Burger from Burger King). All of that means it was an even bigger disappointment when I sat down to eat it. On the face of it, a bacon cheeseburger with cheese, onions and cheese sauce should be really very good. In this case, it was barely above disastrous I’m afraid and I’ll have to explain why. 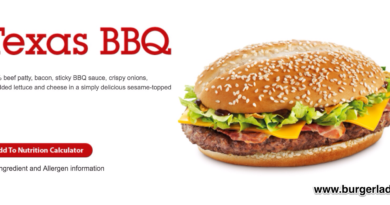 Firstly, yes we know not to expect the actual burger to look exactly the same as the official photographs. When I got this in the promo box, I was greeted with a sea of bread and had to go hunting for the burger. Yes it was the correct bun, with a baker’ split down the middle of the crown. But in reality it was too much bread and dwarfed everything else. That was only the start of the problems however. The patty on this was clearly thinner than the official shots and suggested to me the wrong one was used. 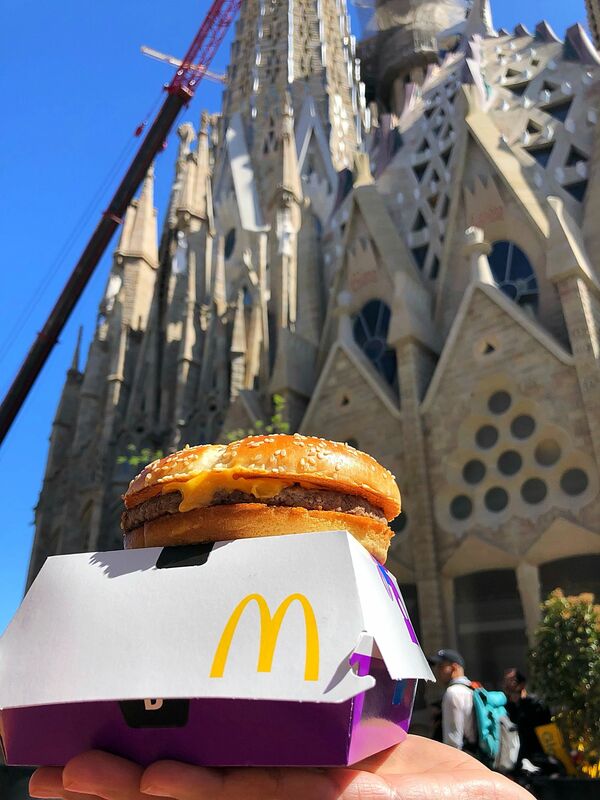 As I bit into it, I did get that classic McDonald’s flavour which pleased me, and the crispy onions on top were delicious. Yet another problem though and perhaps the least forgivable. 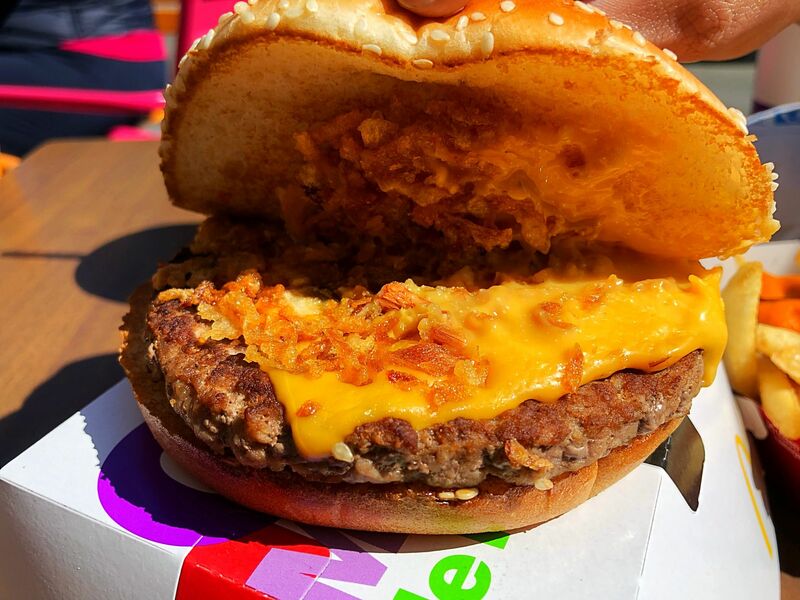 These onions are supposed to sit atop the cheese slice, amongst a cheddar sauce. And horror of all horrors, the sauce was missing. And this branch, right beside the Sagrada Familia, was far too busy for me to take it back. It does taste better than it looks though, but that’s a low yardstick. The labels “intense” and “extreme” are overinflated unless they’re referring to the disappointment. 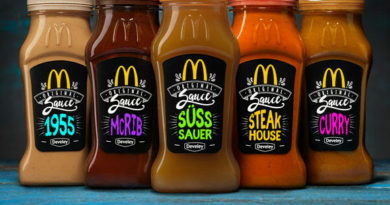 It’s actually one of the most disappointing McDonald’s experiences I’ve ever had, and that’s such a shame because it looks and sounds so good. 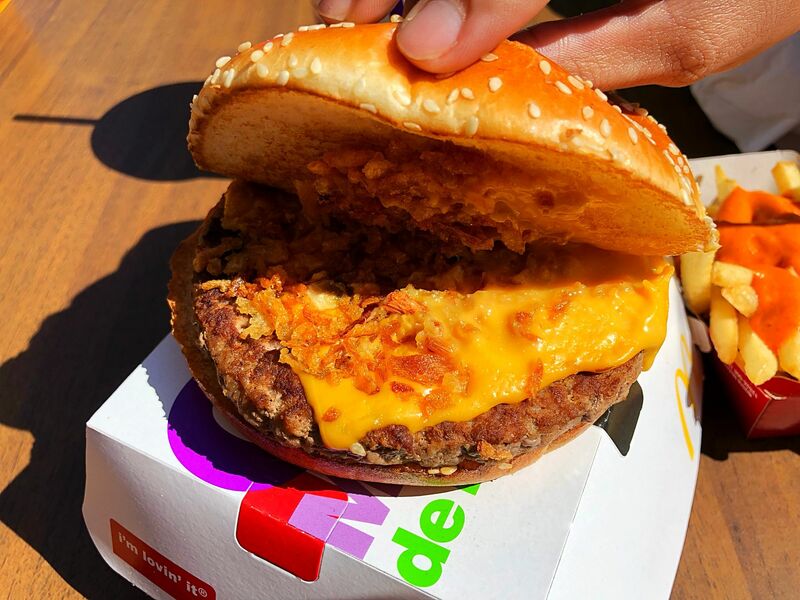 A final disappointment came in the form of the bacon – a couple of paper-thin limp floppy pieces squashed under the beef patty. I left this wishing I’d gone to Burger King instead. 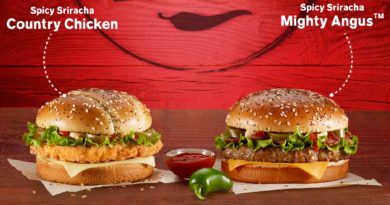 The Grand McExtreme Intense Cheddar is only running for a limited time so this is probably a good thing. 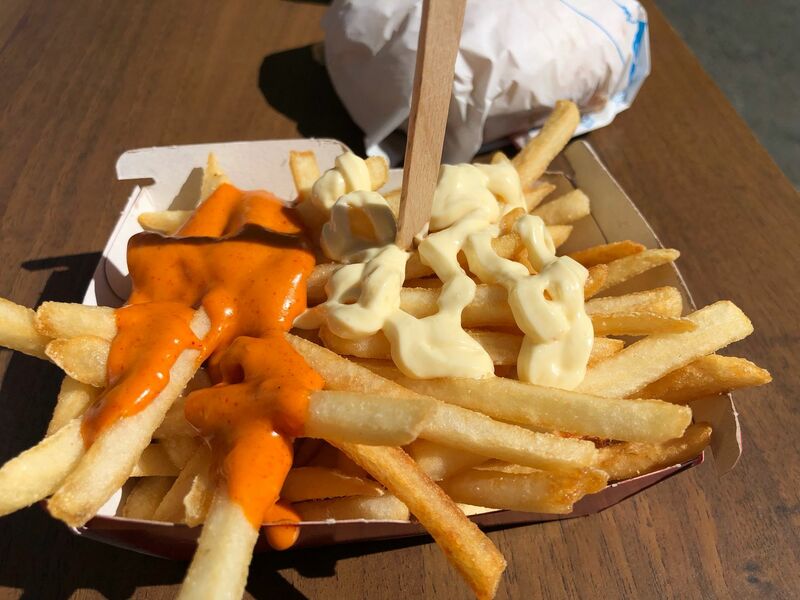 Pictured below are the Top Fries Brava & Alioli which are also on the menu at the moment.